Features include: jumbo-sized body of master grade African Blackwood and Adirondack spruce, ebony fingerboard, five-piece mahogany and rosewood neck with a dovetail neck joint, pinless Madagascar rosewood bridge, two-piece bone saddle, Australian blackwood binding and beveled arm rest, abalone sound hole rosette, Lowden fingerstyle neck and string spacing, Gotoh 510 tuners with ebony buttons. I am impressed indeed with African Blackwood after my first experience with it as a guitar tonewood. 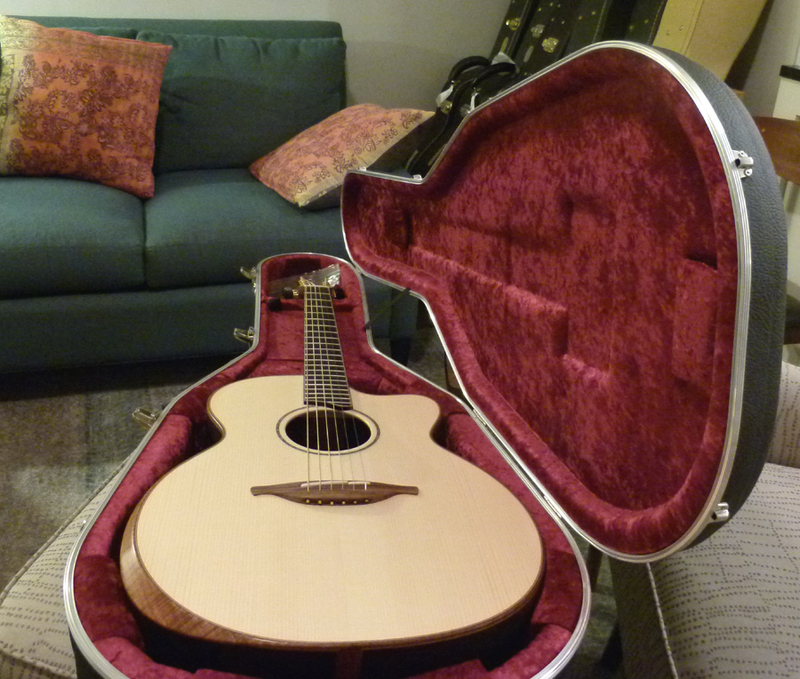 It has come in the form of a Lowden O50C with an Adirondack spruce top. But what is even more impressive is the instrument as a whole. The 50 Series consists of guitars custom made one at a time at Lowden’s factory in Downpatrick, Northern Ireland, by their best veteran hands, using primo materials. From the beautiful, master grade woods, the obvious expert craftsmanship, the sensual display of light and line, of arch and symmetry, of plane and undulation that make up the understated, woody aesthetic, everything suggests the best of the very best. And it has a voice every bit as good as its looks. While it is a notably large guitar with a big voice, it is not boomy. 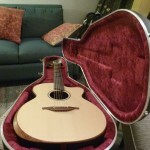 It has a powerful treble response to go along with the impressive bass, and lush overtones from both, which join together and buoy the midrange, allowing for clarity and richness at the same time, with ample separation between the fundamental notes, and a full-bodied depth reverberating throughout the pulsing waves of that signature Lowden sustain. The O size was one of the very first created by George Lowden and it has remained unchanged for almost forty years. 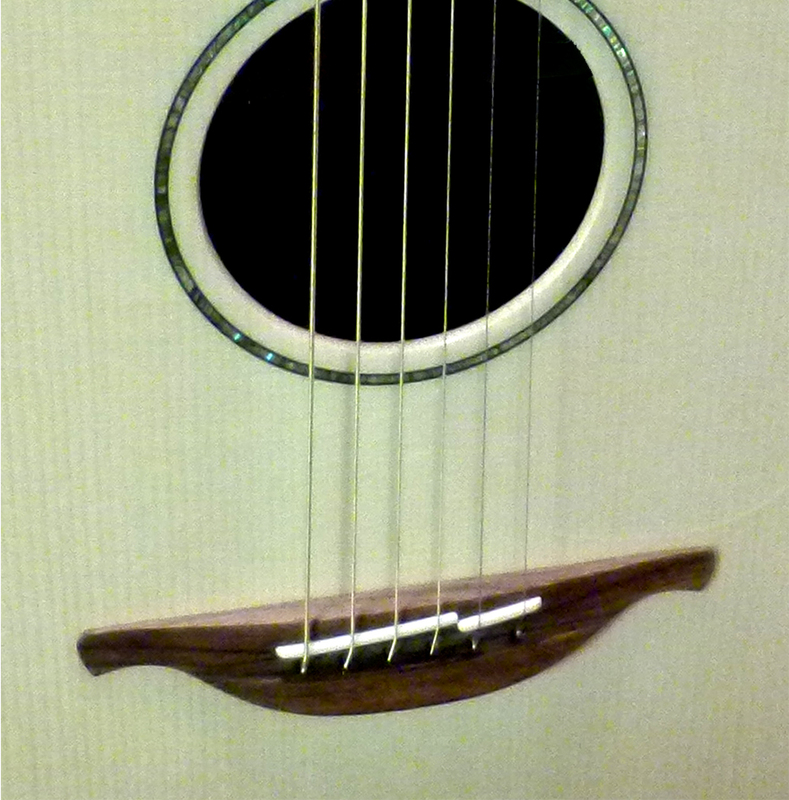 The largest Lowden, it has a top width of 420mm. This puts it a half an inch wider than a Martin Jumbo, and a bit less than the 17” width of Gibson’s Super Jumbo. 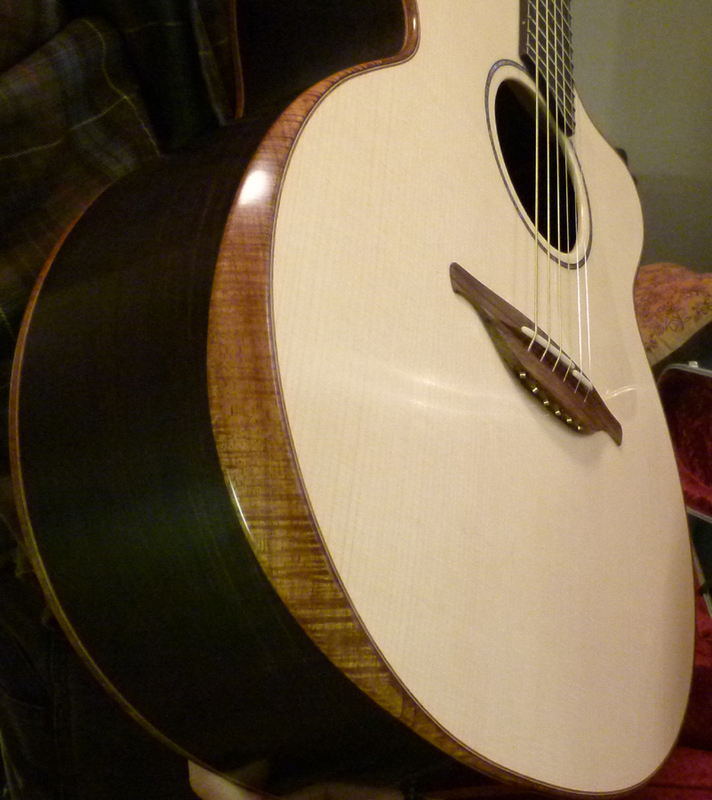 But the Lowden’s depth is 125mm, greater than the Martin or Gibson by 3/64”. And that is not including the perceptible arch to the top. 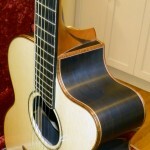 The scale length is 650mm and this particular O was made with the “fingerstyle neck”, which has a width of 45mm at the nut, but widens to a spacious 60mm at the 14th fret, with the same measurement used for the string spacing. This makes the neck a touch longer and wider than that of an American long-scale guitar with vintage specs. 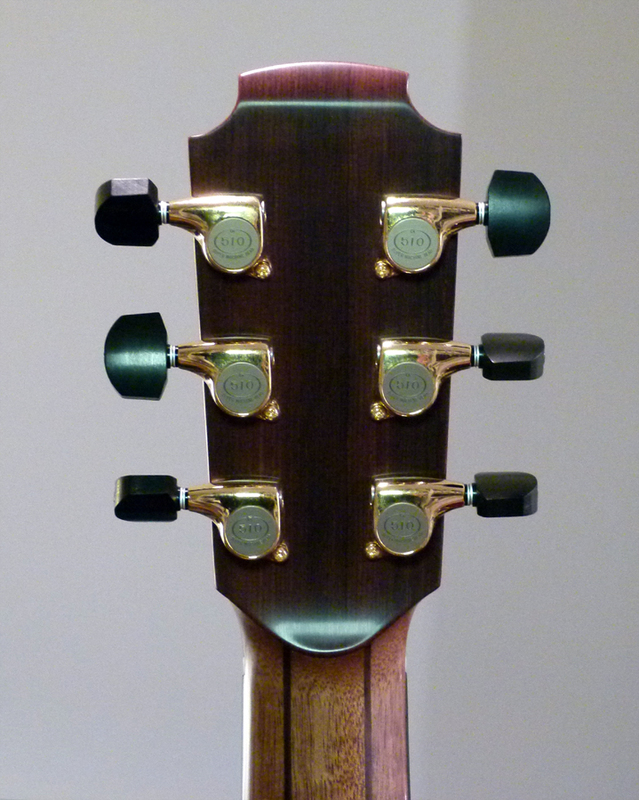 To compensate, the fingerstyle neck features a low profile, one millimeter shallower than a normal Lowden neck. While comfortable, it gets pretty wide for stretches and thumb-fretting unless you have longer fingers. 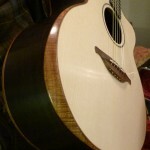 Given the rounded jumbo size, the first thing that stands out is the expansive soundboard of pristine Adirondack spruce. Uniform in its off white hue of pale creamery butter, it has soft, fat stripes of evenly spaced grain, medium wide for Adirondack, which narrow as they grow closer together near the center seam of the perfectly book matched halves. It also boasts silky cross grain, which is very tight and uniformly abundant throughout the entire top. I would say this kind of Adirondack probably makes up $400 – $500 of the construction costs. It comes with a clear pick guard that is placed to cover just where a strummer with a flatpick is likely to put the most scratches. The noticeable arch to the top is achieved with dolphin bracing. 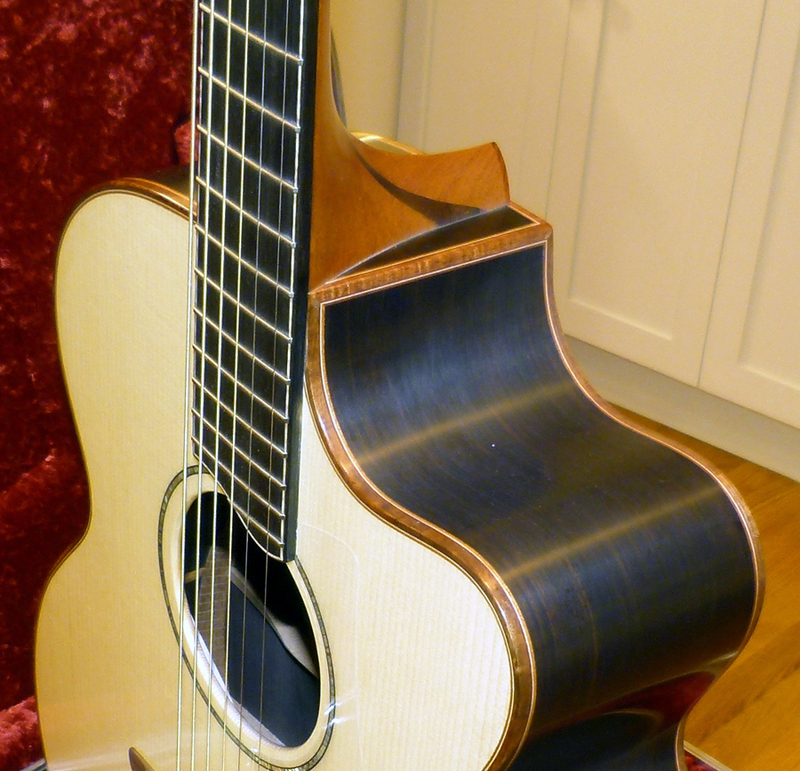 Invented at Lowden, it is thus named because each brace or “strut,” as George Lowden calls them, has a narrow width that is shaped into a slim parabolic arc resembling the curve of a dolphin’s back. Lowden’s top bracing supplemented by an A-frame of two braces that anchor in the neck joint and add stiffness and stability to the upper bout while helping to transfer some of the energy entering the body from the neck so that it directly impacts the main X brace. The result is added sustain and wide ranging dynamics that can stand up to forceful attack, while offering the wavering tonal resonance of a traditional dovetail neck joint that can so enrich the tones of lighter fingerstyle playing. The round sound hole is rimmed in a band of the spruce, set apart from the rest of the top by a single, narrow ring of reflective abalone shell, lined with thin black, as found on the Lowden’s Premium 35 Series. In the center of the soundboard is the gentle curve of the pinless bridge, made from Madagascar rosewood with long, narrow wings. It is like a piece of wooden sculpture, beautifully carved, with lovely symmetrical grain. There is something quite Celtic to the looks. Whether intended or no, when the guitar is stood upright, I was struck by how much the tableau presented by the bridge and rosette resembled some ancient, decorative depiction of a six-mast ship of Celtic or Norse origin sailing under the cornea of a full solar eclipse. Similar attractive features encompass the entire instrument. The body is bound with Australian blackwood, an Acacia species that is not actually black at all without its bark. Rather, it displays a reddish brown version of the shimmery gold figuring of its more famous relative, Hawaiian koa. This is most obvious in the beveled armrest, some 25 mm wide, which reduces the depth of the guitar a bit where one reaches across the top to play the instrument. The jet black ebony fingerboard has no markers, other than side dots, but it is inlaid with a thin strip of glinting white wood just inside the edges. 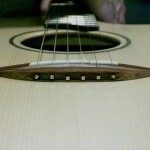 The slight asymmetry added to the round top by the armrest is echoed in a small extension at the base of the fingerboard, which intersects the abalone rosette, adding one more fret under the treble strings. 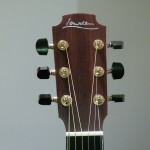 The neck is a stiff, five-piece design typical of Lowdens, and this one is made from three pieces of mahogany separated by two narrow layers of rosewood. At its top there is a faceplate of perfectly quartersawn cocobolo, on both the back and front of the headstock, which goes well with the Australian blackwood body binding. 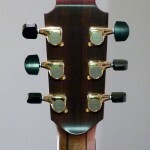 The headstock itself features an attractive, scooped scroll shape at the back, which reduces the overall weight, and which reputedly was invented years ago, when George Lowden accidentally broke off a piece of wood from a headstock and then sculpted it into a gentle curve, and then decided he liked the looks of it. The African blackwood used for the back and sides is very dark blackish-brown, with black accents, and treated with a hand-rubbed satin finish that is basically a matte finish, with an aura of sheen. The figuring is almost hidden until the light strikes it just right, when it suddenly stands out. The center strip is made of reddish Australian blackwood, with uniform quilting set parallel to the grain of the back, lined in maple that melds with the thin strip of blonde sapwood running the full length of the spacious back. From the first strum the full-bodied voice brings a smile. African blackwood is as impressive as its reputation suggests. Also known as grenadilla, it gets its more colorful name because the timber under the bark is naturally very dark and inky in hue. But it has nothing in common with the blackwoods of the koa family, in looks or tone. It is actually a true rosewood (Dalbergia melanoxylon) and shares the same sort of tonal warmth and complexity as its nearest cousins. It has been said to sound like Brazilian rosewood (D. nigra,) the traditional choice for high end guitars that became so scarce it is cost prohibitive. Such claims have been made for many pretenders to the tonal throne, so I remained skeptical in this case. Based on this one example, African Blackwood sounds more like Brazilian than anything I have yet encountered. It has great depth and complexity, being rich and “moist” in how fat the air becomes as the sympathetic overtones bloom during sustained playing. But it is not so thick in the lows that the mids lose their definition. However, it is somewhat darker and thicker than typical Brazilian rosewood, which has colorful complexity across all registers, with great detail in the bass down to the lowest cellars, which makes it sound both vast and deep, but not particularly dark as rosewoods go. 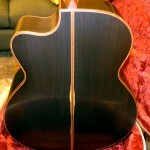 The tonal palette of this African blackwood Lowden is shifted toward the lush and more somber side of the rosewoods, which makes it similar to Amazon rosewood (D. spruceana,) yet with a more expansive basement, and overall there is a lot more going on in terms of complexity and colors than the broad sonic brushstrokes of Indian rosewood (D. latifolia.) In any case, it has a depth and definition in the undertone that sounds to me like the darker, warmer examples of Brazilian rosewood. 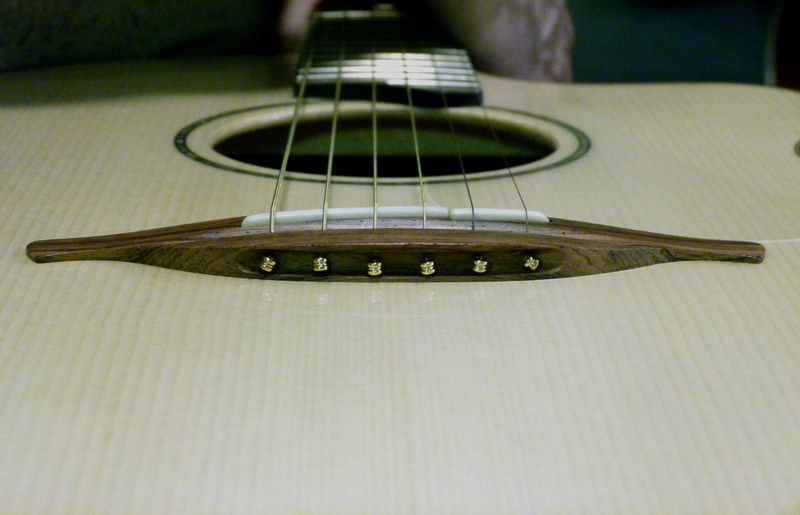 Heck, it even has that special Brazilian peppery spice smell when one sticks their snoot into the sound hole. Because of that deep body and warm tonewood, the crisp clarity of Adirondack spruce was an inspired choice for the soundboard, as Lowden typically uses soft, warm redwood or cedar for their tops. Even more interesting is the Madagascar rosewood bridge, which adds a unique sculpting to the notes off the strings that I hear in other guitars with rosewood bridges. It helps the fundamentals stand out from the thick undertone and allows a certain openness in the top voice of the guitar. 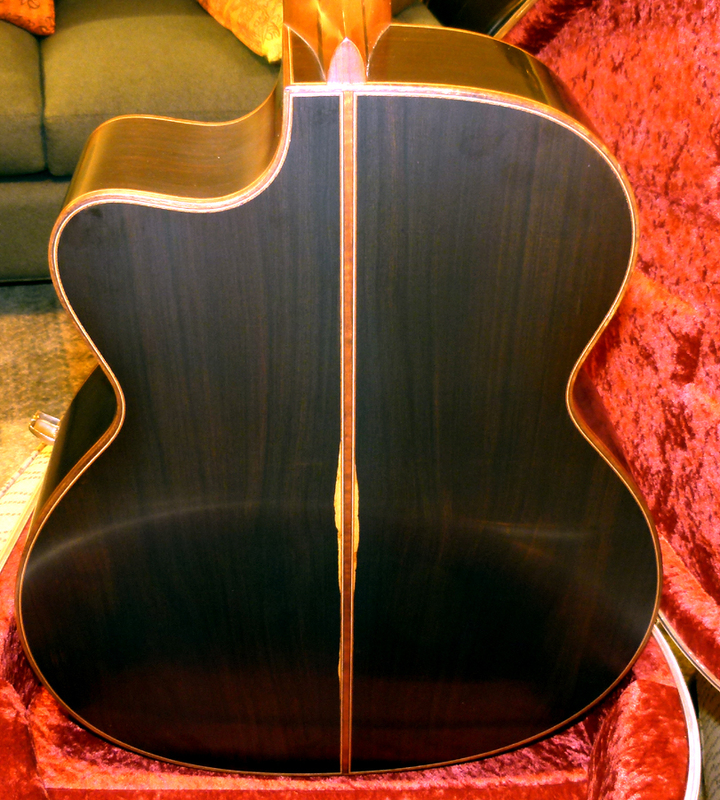 A typical ebony bridge might have made this huge guitar sound a bit thick and woofy. Lowdens take some time to break in, and Adirondack spruce will increase the time frame of that. 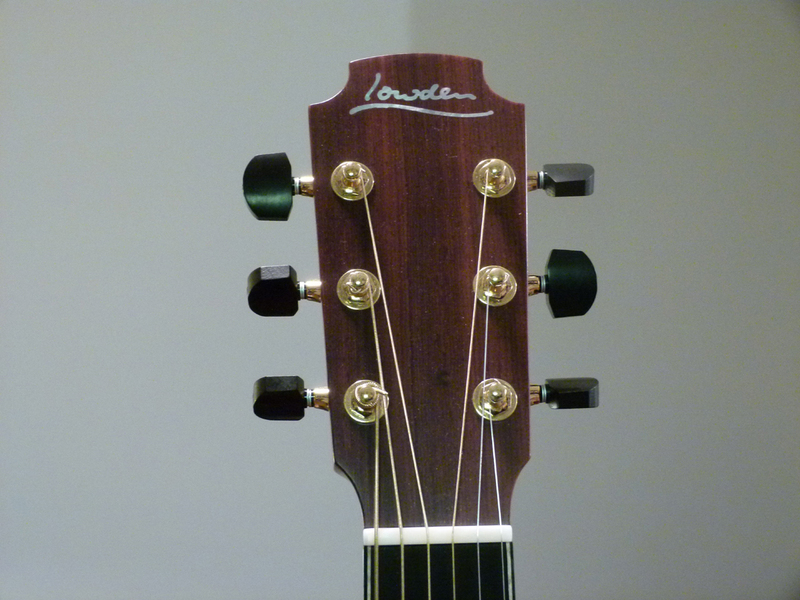 But due to Lowden’s exclusive bracing choices they sound very good even at their tightest. And they will continue to stand up well under the attack of fingerpicks and flat picks as time goes on. This particular guitar has a robust throatiness when the player rolls up their sleeves and digs in. And that will only get better as the top opens up. But when employed for lighter fingerpicking, as practiced by the owner of this guitar, it has a well-rounded throb at the bottom, yet the mids stay very much up front with the trebles, and both ring out full and clear from the sympathetic overtones that accompany each and every note. Even at their lowest level, Lowdens are of high quality. Rich with overtones, yet clear in the fundamental notes, they have a sound not quite like other guitars, which is why some professional artists play them exclusively, while others known for different makes of guitars also own at least one Lowden. They are versatile and appeal most to players interested in something that is traditional yet different from the rest of the pack. But when you get up to the 50 Series, you are getting the best they have to offer. The Good: Serious woods joined together by master craftsman in a world-class instrument of great versatility, with a unique combination of dynamics and pure yet very rich tone. The Bad: Even with the arm bevel it is a massive instrument, matched with a wide neck that adds up to quite a handful for people with shorter arms or fingers. The dense African blackwood may be a bit thick with overtones for some tastes, even if others relish that. The Ugly: The 50 Series is referred to as Lowden’s Custom Shop, where each guitar is made unto itself. So if you want this same list of specs, you will have to order it. But you may find something at a Lowden dealer from the 50 Series, already built in a combination of size and materials you will like even more. And that is one man’s word on the Lowden O50C in African Blackwood and Adirondack spruce. 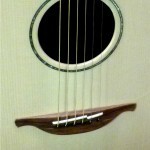 Check out more Lowdens at their website, www.georgelowden.com, or your favorite Lowden dealer, or mine. Since Lowdens are often used by European guitarists playing Celtic music, here is a supplementary video with some examples in DADGAD tuning.